Zakho, northern Kurdistan. Against a green backdrop surround by peaks still capped with snow, the town’s small colourful houses – blue, green and pink – are ranged in bright sunlight under a deep blue sky. Yet who knows what kind of scenes are being played out today in these mountains, whose tranquillity is only a facade, and which now protect what has become a refuge for thousands of Iraqis who fled the violence and massacres that took place in Iraq last summer. I’m on the road with the Caritas Iraq team. We stop in a no man’s land in front of a building of which only the ground level and foundations have been completed. This is where around 100 Yazidi families – from the community persecuted and massacred by ISIS – live, or rather are crammed together. The majority of these families live in what might one day be the garage of this building. Hidden underground. Pieces of wood, cloth, plexiglass and cardboard provide makeshift partitions to separate the families; a few square metres that disappear from view to give a semblance of privacy. A few light bulbs hang along the immense corridor trying in vain to illuminate the prevailing darkness. Indeed, this marks progress, as a few months ago there was no electricity at all. Total darkness confined within icy concrete walls. Caritas heard about these families that are in state of absolute destitution a few weeks ago and has come to meet them. 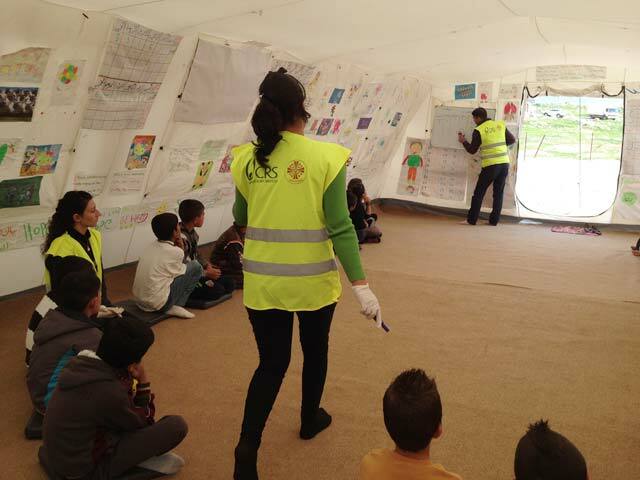 When the Caritas Iraq team arrived in this makeshift camp no one took any notice of them. Several organisations had previously come to see these families, asked them questions and promised to bring them aid. But since then they have never returned. So these abandoned families don’t believe in any possible support, and in part rely only on themselves. Caritas asked them questions and registered them. Caritas also promised to come back and bring them aid. And today the team is there to distribute an ample supply of hygiene kits (soap, toothpaste, washing powder, washing-up liquid, sanitary towels, shampoo, etc.) At the scheduled time the men emerge from their cloth cell and arrive at the distribution point located only a few metres away, stand in line, registration card in hand, and then leave loaded with various products in amounts that are indispensable for their families which sometimes include around 15 children. 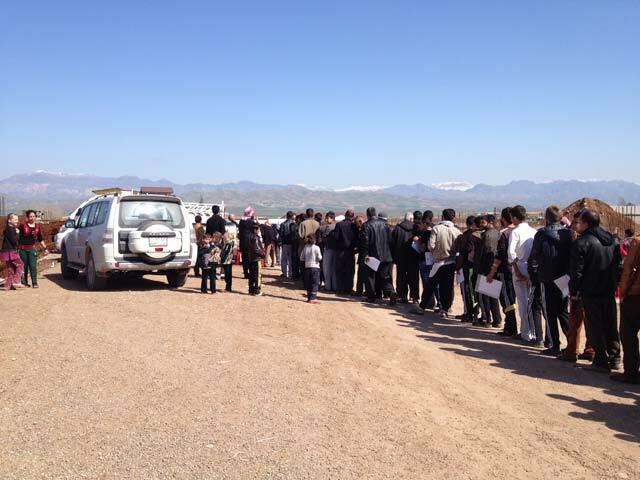 In Kurdistan, displaced families live scattered, sometimes very far away, and often unaware they can receive aid. A lot of referrals take place beyond the humanitarian coordination on the ground: by word of mouth, the various reports that may get to Caritas or other organisations enable aid to reach the most vulnerable people. While some camps are very well organised by the Kurdish government, the number of camps is far from sufficient to welcome everyone. People often have no other choice than to live in buildings under construction, and many other families, in any event, prefer to set up near villages or live near their own community, seeking security and a semblance of freedom. 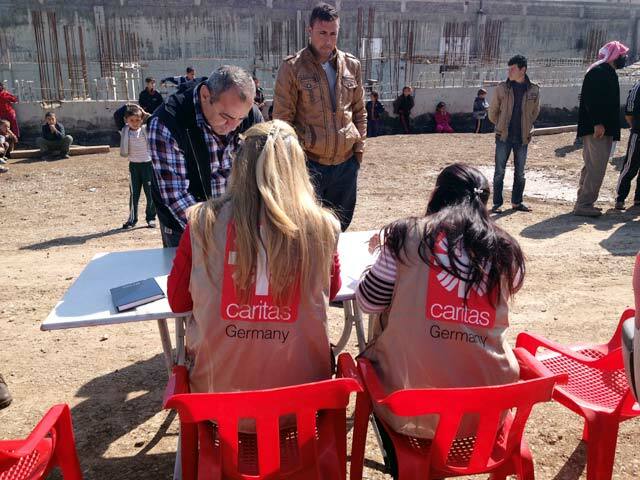 Caritas has decided to help the isolated families in remote locations up to the Syrian border, where often no one is aware of the needs of displaced persons, and where almost no agency can get to. What future do displaced persons foresee after all these months spent in wretched and painful physical and psychological conditions? Very few Christians envisage or want to go home: the only salvation they see is through exile. While the Yazidis are more hopeful about going home, they only contemplate doing so if their security is guaranteed, and they are obviously doubtful about that. On leaving Kurdistan I wonder if all the displaced families I have met during this mission, in Erbil, Duhok and Zakho will still be there during the next mission. I hope not. However, we are aware of the risk that they will stay trapped there, without being able to return to their lands or go somewhere else. A life from now on paralysed and without hope in these such beautiful mountains of Kurdistan.